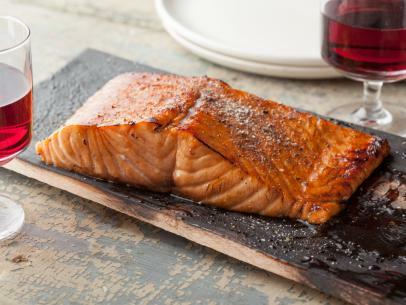 I first tasted Cedar Planked Salmon on a trip to Alaska years ago. We caught it, the guides fabricated it, and cooked it over an open fire on a plank of wood next to a rushing river. All in about an hour start to finish. It was the best fish I ever tasted. I recalled that taste one day when a friend of mine was cutting some wood to line a closet. Hmmm…I wonder if this is the same wood my Alaskan guides used? It smelled like it. I asked him for a scrap. He looked at me with a fish eye (fish eye…get it?). Him: “What for?” Me: “To cook a fish on.” Him: “Not unless you want to kill someone.” Most wood from home building suppliers is treated with chemicals to help preserve its integrity. 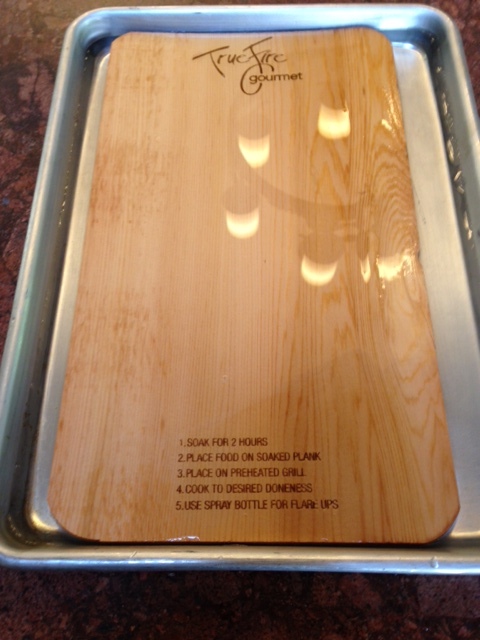 Make sure you are using UNTREATED WOOD to cook with. You can often get it at your local hardware store and have them cut it to size; this is handy when you want to do a whole side of salmon. Or you can often find smaller packs specifically made for cooking at many big box stores in their kitchen section. Kitchen gadget stores, both brick and mortar and on-line, have cedar planks too. 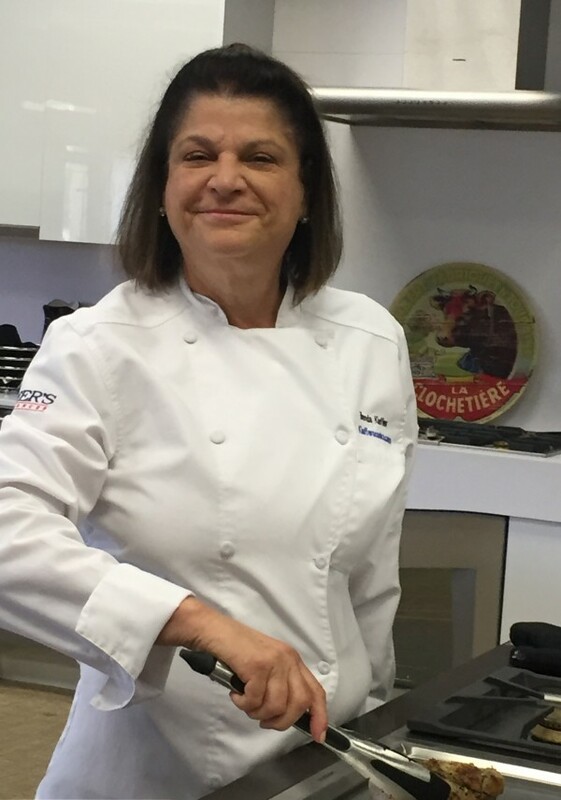 Cooking on wood will instantly make you a gourmet chef with very little effort or risk. Sounds good, right? Read on. Soak the plank in water to cover (weight it down if you need to with a heavy can) for about 2 hours; possibly longer if you are using a thick plank like you get at a hardware store. Soaking will help keep the wood moist during cooking so that it doesn’t burn to a crisp before the fish is done. The board SMOKING is what you want to achieve, not a conflagration. DON’T SKIP THIS STEP!! Preheat your grill with all burners on high for about 15 minutes. Remove the plank from the water and pat dry. 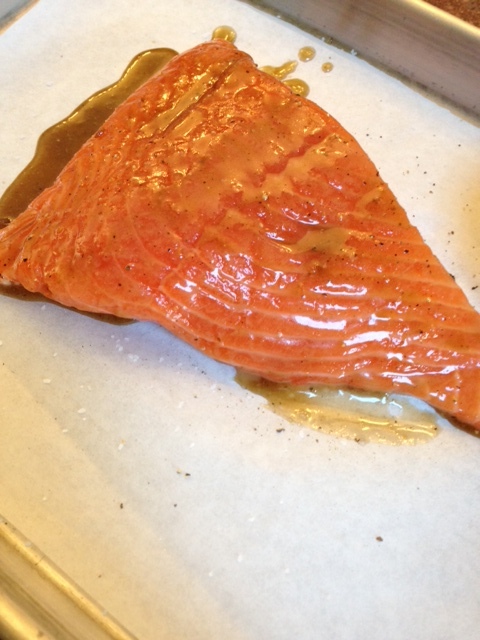 Place your salmon skin side down on the plank, salt and pepper it and brush it heavily with the basting sauce. Turn off the middle two burners or if using charcoal, move it out of the way. This is indirect grilling, people! Place the plank over the burners that have no heat under them. Cover the grill and let ‘er rip for about 20 minutes for salmon that is about 1 inch thick. Baste with the sauce at least twice during cooking. Skin side down on the plank! I like my salmon medium with just a little bright pink in the middle. This translates to about 135° on an instant read thermometer inserted at the thickest point of the fish. It’s important to understand that the time will vary greatly depending on the thickness of the fish and the internal heat of the grill. If I don’t have a thermometer, I look for the white fat gathering on the top and sides of the piece of fish. This is an indication that it is done to medium. If you are not sure, cut it apart at the thickest point and take a peek. If you like it cooked all the way through, take the temperature to 145°. It should take about 10 minutes longer. Keep an eye on the grill. You want some smoke surrounding the fish, but you don’t want the plank to catch fire. Keep a spray bottle for flare ups close by. When the fish is done to your liking, remove the whole plank from the grill and have a sheet pan handy to place it on. This sucker is HOT! If you can, bring the whole set up to the table for an impressive presentation. You may even see a bear in the distance. No, you can’t reuse the plank, you cheap so and so. 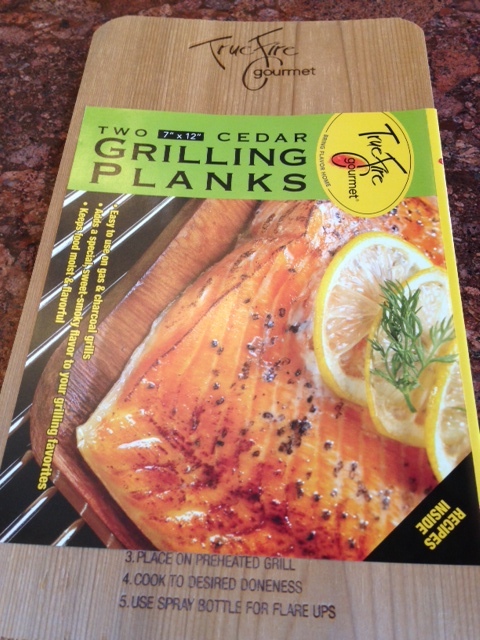 Wait until the end of grilling season and you can buy the plank packages for half price.